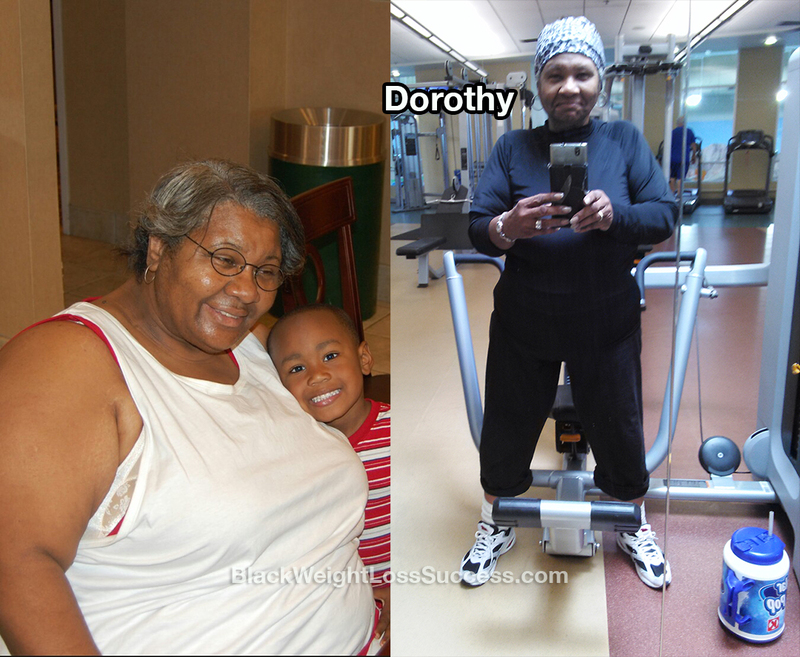 Transformation of the Day: Dorothy lost 109 pounds. She is fit, fabulous and a true inspiration at 63 years old. After years of going back and forth with her doctor about her weight, she was given a stern warning that changed her life. Exercise, cutting carbs and eating clean has given her a new lease on life. I am 63 years old and I began my journey on December 8, 2015. I’ve lost a total of 109 pounds and kept the weight off. What worked for me? Clean eating, cutting out carbs and exercising 5 to 7 days per week. On December 8, 2015, I went to a doctor’s appointment. I was borderline diabetic. I also had high cholesterol, high blood pressure and all the health issues that can come along with being overweight. My doctor and I have been going around and around in circles, talking about my weight for years. She is the kind of doctor that you hate, but love at the same time. That day, Dr. Hallman never looked up at me while she was talking. She continued to type on her laptop computer. She simply said, “You lose weight or you die.” That had never come out of her mouth before. So, I went home, prayed and came to the conclusion that I had to do this by the grace of God. I began to watch what I ate and I went to the gym 6 to 7 days a week. In the beginning, I stopped eating bread and potatoes, but eventually I cut out all carbs. My starting weight was 337 pounds, and now I weigh 228 pounds (as of February 27, 2017 – Height: 5′, 6″). I’m still in the struggle, but I have a lot more energy. I will be 64 years of age soon. I do cardio 4 days a week. I do 2-3 days of core and weight training. I am at the gym for 2-3 hours per day, 5-7 days per week since I am retired. Thank God for my doctor’s encouragement. Now, I’m getting it in and getting it done. If this seasoned woman can do it, you can too. What I eat: I eat lots of veggies and fruit (Heavy on the vegetables, moderate on the fruits). When I have a meal, it consists of grilled or baked chicken or fish, a green salad, baked yam, string beans, etc. I love bread and potatoes, but I only eat them once a week so I don’t feel deprived. I also try to drink at least 75 ounces of water per day. I have oatmeal 2 times per week with brown sugar, butter and cream. I drink a green smoothie/meal replacement smoothie twice a day, which consists of: spinach, pineapple, papaya, banana, protein powder and coconut oil. Snack foods are a must for me. I cut up cucumbers and apples. Then, I put apple cider vinegar and maybe a little salt on the slices. It’s very good and satisfying. I also have cherry tomatoes with apple cider vinegar and tumeric powder. I love Coca-Cola and will have one every now and then, but not often. Do you have a weight loss transformation story that you’d like to share. Send us your story today. 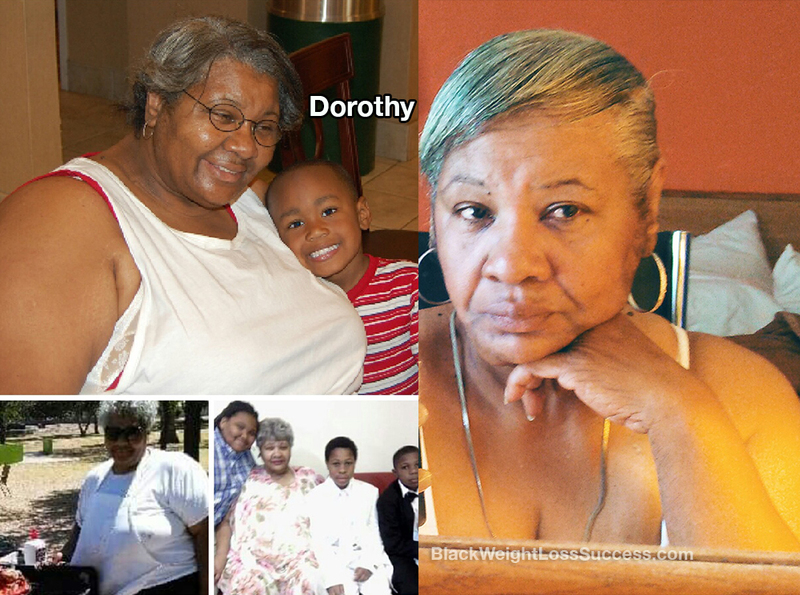 Thanks so much Ms. Dorothy for sharing your story. You are an inspiration and you look terrific! You look fabulous congratulations on your journey! I am in your age group, and you are truly an inspiration! You’ve made me realize that the only thing keeping me from doing it,…..is me. You are truly an inspiration and have given all of us something to think about. I am looking forward to retirement but am not there yet. I have similar health issues and know it is time to make a change. That’s amazing, good for you, keep it up. Your weight loss story gives me hope. I am already injecting insulin 2x per day, and taking 4 pills per day. Thanks for all your help!